If there is one thing that defines our work experience today, it’s stress. It can be exhausting or exciting—often both. But if we’re not proactive, it can really ding our health. For several years I mentored a small group of young professionals. We met once a month and discussed our jobs, families, and personal lives. One recurring topic of conversation was stress. There were guys at the top of their career and others struggling through rough times. But regardless of their circumstances, they all confessed to feeling under heavy pressure a lot of the time. This is the norm. Most surveys show that we work far more than 40 hours a week. One study found professionals who use smart phones—that is, like me and probably you—average more than 70 hours! We’re always on, and it’s wearing us out. According to World Economic Forum’s Human Capital Report, Americans are some of the most stressed out people on the planet. For some of us stress is a “status symbol,” as Florence King said. It makes us “feel busy, important, and in demand, and simultaneously deprived, ignored, and victimized.” Either way, we get a sense of importance from our burdens. Others might actually be addicted to stress. It can actually trigger the same neurochemical reactions that drugs do. We get used to it, and then we feel uneasy when we’re not under pressure. Whatever the reason, the effect of all this stress is major—starting with fatigue and running to a long list of physical maladies. It can compromise our immune system as well as our cognitive capabilities. In other words, stress can make us tired, sick, and stupid. And the longer we keep up the pressure, the greater chance it’ll blow up in our hands. So what are we supposed to do? We’ve talked a lot recently about the importance of sleep and rest. 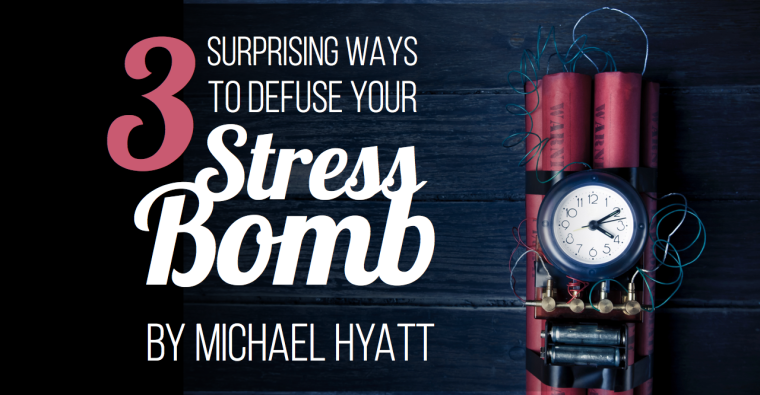 That’s key, but here are three surprising ways to defuse your stress bomb. It might seem like working out would compound our stress, but it not only dials back stress chemicals like cortisol and adrenaline; it also triggers mood-boosting endorphins. Instead of adding to our stress, exercise washes it away. And you don’t have start training for an triathlon, either. “Almost any type of exercise will help,” according to Harvard Men’s Health Watch, which recommends at least “30 to 40 minutes of moderate exercise such as walking or 15 to 20 minutes of vigorous exercise.” They say more intensive exercise is even better, but the real key is doing even a moderate amount nearly every day. Based on that, it’s no surprise that a recent study found people who regularly exercise are “less likely to be stressed at work” and more optimistic about juggling the demands of work and home. “As a man thinks in his heart, so is he,” said Solomon. It turns out this proverb has direct application to the way we handle stress. We tend to experience stress the way we think about it, according to a Yale University study. If we think of it as debilitating, it affects us more negatively than if we put a positive spin on it. “Our research suggests that improving one’s response to stress may be a matter of shifting one’s mindset,” said the researchers. Perception is reality. Stress does have upsides for personal performance. So the researchers had participants watch several short presentations on those benefits. The result was that the subjects experienced more of those benefits compared to others who focused on the downsides. Participants who got the positive messages “reported improved psychological symptoms and better work performance,” said researchers. So just changing our mindset can reduce the negative effects of stress. I love dogs. My daughter Megan brings her dog Bear to the office all the time. He’s a calming presence and provides a good excuse to get out a walk a few times during the workday. If you have a good dog, you may already know this, but working with our dogs can keep our stress down. Research from Virginia Commonwealth University found when dogs accompany their owners to work, their owners leave with less stress than when they arrived. Dogless employees didn’t fare as well. They actually got more stressed as the day progressed. “The study compared stress, job satisfaction, organizational commitment, and support, and found that dogs in the workplace made a big difference in all four areas,” said reporter Kim Fernandez. Some companies are welcoming of pets in the workplace, though definitely not all. Still, if you have the freedom to do so, it can make a big difference. All three of these methods point up a fundamental truth: We have agency. We don’t have to let stress win. It doesn’t run the show. We do. We can be, as a family friend puts it, militantly on our own side. That might look a bit different for everyone, but moving our bodies, shifting our thinking, and petting our dogs are great places to start.